WASHINGTON (Reuters) - A Senate panel hearing on President Barack Obama's nominee to head the Internal Revenue Service was set to resume Wednesday after it was abruptly halted on Tuesday at a Republican senator's request, committee aides said. 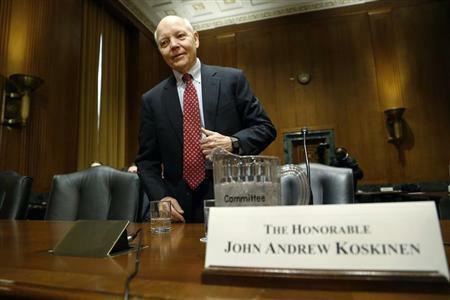 John Koskinen, a 74-year-old lawyer with little tax experience chosen by Obama to take over the beleaguered IRS, traveled up to Capitol Hill to face the Senate Finance Committee, but the session did not last long. Koskinen gave an opening statement and took two questions from lawmakers. Then Democratic Senator Max Baucus, committee chairman, called a halt to the hearing, citing a procedural time limit on hearings. The time limit is typically waived but was invoked by a Republican senator on Tuesday, according to one Republican Finance Committee aide. The identity of the lawmaker who invoked the rule was not disclosed, and his or her reasons for doing so were unclear, aides said. The hearing was rescheduled for 9:15 a.m. (1415 GMT) Wednesday. Before the session's abrupt end, Koskinen told the panel he would work to restore public trust in the IRS and called on Congress to stop cutting the tax agency's budget. The committee had been expected to vote in favor of Koskinen's nomination before the end of the year and to send it to the full Senate for consideration, lobbyists said. Called out of retirement to take on a tough job, Koskinen said he was "excited" to be IRS commissioner but acknowledged a daunting list of problems awaits him. He said the next commissioner must rebuild the agency's tarnished image. A political uproar engulfed the IRS after a senior agency executive apologized publicly in May for unfairly subjecting conservative political groups seeking tax-exempt status to extra time-consuming scrutiny. The controversy that ensued cost the acting head of the IRS his job, triggered multiple investigations and badly damaged the agency's reputation for political impartiality. "Taxpayers need to be confident that they will be treated fairly, no matter what their background or their affiliations," Koskinen said his opening remarks. "Public trust is the IRS's most important and valuable asset." The Obama administration proposed new rules last month to rein in the political activity of tax-exempt, social welfare groups of the sort that were at the heart of the IRS crisis. Orrin Hatch, the committee's top Republican, pressed Koskinen to widen those proposed rules to include tax-exempt business groups and labor unions. Koskinen said he will "actively participate" in the review of public comments submitted to the IRS on the rules. Looking to the 2014 tax season starting early next year, Koskinen said customer service may suffer from funding cutbacks. The IRS will have 11,000 fewer people working on filings next year but is expected to process the largest number of returns ever, he said. The IRS has about 95,000 employees. "We need to solve the funding problem," Koskinen said. If confirmed, Koskinen would serve a five-year term. He would replace Danny Werfel, who was appointed acting IRS commissioner by Obama in May. Werfel, a former White House budget official, will be leaving the IRS at the end of the year, Baucus said at the hearing. "I hope we can approve (Koskinen's) nomination quickly and take it to the full Senate for a vote," he said.